Let’s be honest. There are some great blowup hot tubs, but also a few not so good ones (and some that are just plain bad, yes, talking about you Radiant Saunas hot tub). So which inflatable spa is the right for you? Well, check out our inflatable hot tub buying guide and reviews below. For impatient: Click here to see our #1 top inflatable hot tub right NOW on Amazon. It’s affordable and has enough space for four people. We spent a lot of time researching inflatable hot tubs (and still do! ), so we feel very confident to show you our top pick which won’t let you down. Stylish design, high quality materials and pleasant air jets. While PureSpa doesn’t offer many premium features, the amazing price and great relaxation it provides makes it our current TOP pick. If our top pick is not what you are looking for, there’s plenty of other hot tubs to choose from. Take a look at our table of best inflatable hot tubs we found during our (still ongoing) research. We did our best to order the hot tubs fairly, taking into account the price, reliability, design, popularity, features, user feedback and plenty of other variables. Inflatable Hot Tub: What to keep an eye on? Let’s talk about a few points which make the most difference between inflatable hot tubs. This is the one most important feature of a hot tub, so read carefully. Let’s begin with the most used and most popular option, the AirJets. Most of the inflatable hot tubs have air jets. They are cheaper to manufacture and provide affordable but amazing massage. How come they are so cheap? Well, they reuse the same blower that inflates your spa when setting it up for pushing the air through a hose into a ring on the floor with holes in it. While this doesn’t sound very sophisticated, the massage and tinkling feeling on your skin is actually very pleasant. Inflatable hot tubs with airjets are generally cheaper than those with water jets. Air jets are surprisingly very pleasant! The blower can be loud. The heater often cannot be run simultaneously with air jets. They cool the water pretty quickly. While water jets are a common occurrence in a conventional built-in jacuzzi, they are rarely found in an inflatable spa. Why is it so? Well, it’s due to manufacturing costs. Water jets need a powerful water pump and high-quality and reliable water piping. Actually, there’s only one inflatable hot tub in our top list offering this awesome feature. It’s the SaluSpa Hawaii (Check it out). These are the jets that expensive built-in hot tubs use. The massage of these jets is much more focused on one spot. The jet of water is applying direct pressure to your skin. The focused jet of water under high pressure makes a unique massage experience therefore water jets can give you a much stronger and more direct massage than air jets. The water pump is less noisy than it’s air counterpart. No heat losses due to cold air being pushed into the water. Together with hot water, they are awesome for relieving sore muscles – check out this study. Hot tubs with hydrojets usually also have airjets, so you are not missing out on anything. The price is usually a double of what an ordinary airjet inflatable hot tub costs. The smallest inflatable hot tub available is this two person spa. The biggest hot tubs can accommodate up to six people – but be ready for some underwater leg touching if six grown-ups meet in there :-). Volume wise they range from around 150 gallons up to 300 gallons of water. The latter is more than 2,500 pounds of weight, so be careful about the place you plan to fill it with water at. Most of the hot tubs have very sturdy walls. One can sit on them and they won’t bulge. They use a variety of materials, some better, some worse, for the best quality, check out our top picks in our top list. Another important aspect is the heater unit. Most of the hot tubs have an external adjacent unit where all the important stuff is (heater, blower, a control panel on top). Some newer hot tubs have this unit built-in into the wall of the spa. This is beneficial for those of you with less space available. This feature prevents a buildup of limescale which is a major cause of blow up hot tub pump breakdowns. Luckily, this feature is found on most of inflatable hot tubs. Unfortunately, this (AMAZING!) feature is only available on one inflatable spa currently available. It’s SaluSpa Paris (Go check it out). Saltwater system eliminates the need for adding chlorine or shocking your spa and thus saving a ton of time and struggle. What’s even better is that the spa won’t have that typical chlorine smell. You might know it from older pools. Modern pools are often using other ways of sanitation. If you have problems breathing the air with the smell of chlorine, a saltwater treatment system is more suitable for you. Now, this is a feature that is one of a kind. This is an inflatable spa (check it out here) that’s joined with a … pool for children! One half is for your children with cool water (It’s dangerous to do excessive physical activity in hot water) and other half is a hot tub for you to relax in. While this takes a lot of space, just like an ordinary pool, it’s a perfect choice for a family with children. Children usually don’t enjoy staying calm and relaxing in a hot tub. So this product joins those two opposite worlds together. This is the best inflatable hot tub on our TOP list. It is both really affordable and really luxurious. Don’t forget to check out our comparison of best intex inflatable hot tubs. We reviewed the 77-inch Round “Massage Spa Set” version of the spa. There’s also a bigger version available if you wish. Why buy the Intex PureSpa? Well, this is our winner. This is the best inflatable spa for the money! Intex PureSpa – a blowup hot tub with a very nice design. It comes with a built-in hard water treatment to prevent limescale build-up. The build-up of limescale can lead to clogging of the pump and filter cartridges. 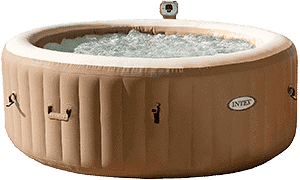 If you wonder if Intex inflatable whirlpool has a cover included – it does, just like most of the inflatable hot tubs. It’s important for lowering the temperature losses. Having a jacuzzi without a cover is a terrible idea – the electricity bill would be much higher. But it’s not just for insulation – it also serves as safety function and prevents children from falling into the spa, as well as preventing dust and leaves from contaminating the water. With a water capacity of 210 gallons, it has enough room to sit 4 people. What about the massage? Well, Intex spa has 120 air jets for optimal relaxation. Intex PureSpa also has a built-in grab handles for super easy transportation. Intex also included a carry bag. So the question remains, how do you control the temperature and the blower? The industry standard is a digital control panel on top of the heater. This spa is no exception. The panel is easy to read and very easy to use. How do you pack it and store it? Just drain the water, let it dry, deflate, put it in a carry bag, and put it in the basement. That’s the best thing about blow-up spas, the way you can store them away. The whole process is easy and straightforward. 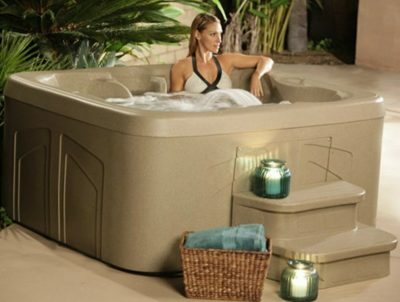 Lay-Z Spa is a 4 person hot tub manufactured by Bestway (and licensed by Coleman). They manufacture a range of products from outdoor camping stoves to blow up spas. So what’s so great about this portable spa? Let’s start with the water. The heater can heat it to the maximum temperature of 104F (trust me, it’s really hot). Actually, this maximum value is set by law to protect your health, so you won’t find hotter hot tub than this. It also has a cushioned air pad floor for better thermal insulation, protection against air leaks, and improved comfort. The gross weight of the package is 86 Lb. Does it seem heavy to you? Well, air-filled hot tubs are not the same as your blow-up baby toy, they have to be really sturdy to keep their shape at all times. Don’t forget this includes Coleman hot tub together with a heater unit with an air blower and water pump. Coleman Lay Z Spa is made of TriTech material, which is basically a polyester mesh core encased in two layers of PVC. This makes it very durable. Filling and draining are easy, just use your garden hose. Depending on your water flow rate, filling might take around one hour. Check out these 3 easy steps in our FAQ on how do you blow up a Coleman lazy spa. When the water heater with a pump is turned on, expect a power consumption around 1.25 kW. That might seem like a lot, but keep in mind that the heater only works when it needs to heat the water. Most of the time it only holds the temperature steady at much lower power consumption. While not first on our list, a still very impressive inflatable hot tub is a SaluSpa Paris made by Bestway. Bestway is a well-known brand when it comes to pool products and spas. It’s usually not the most affordable one, but it has a really nice design with one of the most awesome features: LED mood underwater lights. What does SaluSpa Paris bring to the table? SaluSpa Paris (formerly known as Bestway Lay-Z-Spa Paris) is a very popular option. Affordable price, high-quality materials, and advanced features. Let’s take a closer look. SaluSpa Paris inflatable hot tub comes with a cushioned air mat floor. Setting up your hot tub on an appropriate surface is crucial to avoid possible piercing of the inflatable wall. Cushioned air mat floor will make it more pleasant to sit, while also improving heat insulation. More than that, air pad will protect the bottom of your spa from splinters and sharp stones which could damage the under-body of your blow-up spa. Check out this cool video of SaluSpa Paris blowup spa in action! The atmosphere created by LED lighting is awesome! Most of you are probably more interested in the AirJet massaging technology. So how does it work? SaluSpa Paris uses Bestway’s AirJets technology, which is just a nice way of saying that the hot tub has bubble jets :). This one actually has 87 bubble jets. Bubble jets are commonly used in all inflatable hot spas. Bestway introduced a new model of inflatable hot tub called SaluSpa Hawaii, which has real hydro-jets (together with AirJets) that shoot water instead of air. Bubble jets should be enough for most users, but if you want an outstanding massage, check out SaluSpa Hawaii. While air jets are not the same as water jets, you will be surprised how powerful and pleasing they are. How do you control the temperature? The hot tub comes with an integrated digital control panel on top of the heater unit. There you can control temperature, turn on air bubbles or turn off the heating. Unfortunately, the included remote control only controls the built-in LED lights. The unique feature of this air-filled whirlpool is a built-in LED strip which illuminates the water from the bottom. It’s controlled via a remote control and is very beautiful in the dark. While the manufacturer claims capacity of 6 people, our experience is that 4 adults are enough to stay comfortable. Another great blowup hot tub from Bestway. This rectangular spa is a little more expensive than others, but it has a reason – It is an inflatable hot tub with water jets – and it’s the only one in our list. All other inflatable spas have air jets, which are very pleasant, but water jets have their own advantages. What’s so special about SaluSpa Hawaii inflatable jacuzzi? Hydrojets are common in conventional built-in spas but are not often seen in inflatable hot tubs. They provide the ultimate massaging experience by thrusting water through the adjustable nozzles at high speed. One of their advantages is that running water pump is much quieter than turning on air bubbles. Hydro-jets also don’t cool the water as much as air jets. So how many water-jets does this hot tub have? Eight adjustable water-jets + air jets. Great, isn’t it? But it’s not just that. It also has a built-in saltwater and hard water system. It has a capacity is 4-6 people, but our experience says 4 adults is enough if you want to stay comfortable. The water capacity is typical 210 gallons. This is around 1700 pounds of weight for the water alone. Bear this in mind when thinking about where to place your hot tub. While having HydroJets together with AirJets is great, it’s a pity that they cannot be run simultaneously. This intex blowup jacuzzi is a bigger brother to this one. With a claimed capacity of 6 people and water capacity of 290 gallons, it is actually the biggest one in our list of best inflatable hot tubs. What are advantages of Intex 85in PureSpa? Intex included an insulated cover to greatly minimize heat losses. 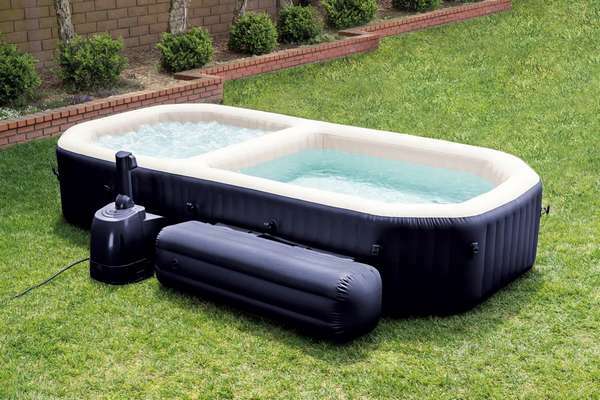 Covering your blow-up hot tub after use can greatly lower your monthly bill! Furthermore, Intex PureSpa blow-up spa has a built-in hard water treatment system which softens the water, reducing the limescale build-up. There are some cool ad-dons for this blow-up Jacuzzi available like inflatable headrest or special cup holder. The typical inflatable spa has up to 120 air jets, this one has 140 of them! It’s easy comparing numbers, but we believe you won’t notice the difference between 120 and 140. Floating chemical dispenser is included together with two filter cartridges. Thermal ground cloth for basic thermal insulation is in the box too. There are grab handles on the sides of the spa to make transportation a breeze. Of course, the spa has to be empty. The 290 gallons of water will weight around 2400 pounds alone, without the weight of the inflatable hot tub or people inside! So take that into account when thinking about the right place for your blow-up spa. This is yet another great spa from Bestway. While it doesn’t have as many features as our best inflatable hot tub, it still has a lot to offer. Unlike SaluSpa Paris, SaluSpa Palm Springs portable jacuzzi doesn’t have that cool LED lighting. If that’s an issue for you, check out SaluSpa Paris. The manufacturer claims a capacity of up to 6 people – it is possible, but it’s a tight fit. This one comes with a cushioned air pad floor for extra protection & insulation. If you want to further minimize heat losses and improve comfort, use additional mats/old carpets or anything suitable. SaluSpa Miami is a common 4 person inflatable hot tub with no extra features like LED lights. It has 120 bubble jets, a common value for air-inflated spas of this diameter. What does SaluSpa Miami offer? Together with other soft inflatable hot tubs from Bestway, it uses their TriTech material –polyester core encased in two layers of laminated PVC. This gives this spa extra sturdiness and robustness. This plug and play jacuzzi is delivered with an inflatable cover, which is a great way to lower thermal losses and make it safe by covering the water. SaluSpa Miami comes in a black color, which might not be relaxing for everybody. If you rather like green, check out this inflatable hot tub. This is one of the newcomers to the market. That’s why we choose to be cautious as its weaknesses are not discovered yet. So far, it seems like a solid inflatable hot tub. What does Goplus spa offer? Manufacturer states a capacity for 4 people. Just like with every other hot tub with a claimed capacity of 4, it’s doable, but definitely not comfortable unless you are close friends (A lot of leg touching guaranteed). Possibly the most unique and best feature is integrated heater and blower inside the wall of the spa. This makes it take even less space than other hot tubs in this category. The digital control panel is right in the wall of the spa, making it super easy to change the settings from the water, without the need to reach over the side of the hot tub to an external control panel. Hard-water treatment system is included to prevent a buildup of limescale and make the water more pleasant to the skin. This is nothing like you ever saw before! We saved this one for the end because it’s not just a classic inflatable spa, it’s actually a hybrid of a hot tub and a pool! What is it good for? What kind of hybrid is this?! Well, children often enjoy playing and having fun in a pool, while parents would rather soak in a hot water and relax. Making physical activity in a hot water is not the best idea, especially for small children. Now you can play games, like throwing a ball, together with your children. They will be playing in the pool, while you will enjoy a hot and relaxing spa. The hot tub part, which is smaller, seats up to 4 people. The pool part is bigger, and would definitely seat another six people. But we don’t think it’s meant for sitting. Hot&cold together is awesome! Check out these 5 things which hot tubs and saunas have in common! This hybrid comes with a built-in hard water treatment, to prevent clogging of the water pump and to make water more pleasant to the skin. An insulated cover is a must, radically reducing heat losses, so intex included it in the package. So this is how it looks like in reality! What is the best portable hot tub to buy? A non-inflatable portable hot tub is usually more expensive than a similar blow-up spa, but it offers much more. Anatomically shaped seats with real water jets provide the same relaxation as a built-in jacuzzi. Lifesmart Rock Solid Simplicity free standing hot tub is an easy to set up portable spa for 4 people. It has real water jets (12 of them) – exactly as expensive built-in whirlpools. To make your day even better, it has a waterfall! When it comes to spa care, it is really easy to maintain. It’s made of eco thermoplastic. Durable material for all weather and all season use. Absolutely not! You set it up and plug it into your conventional 110V socket, fill it with water and you are good to go! While most of the inflatable spas will work in a mild winter, our best inflatable hot tub for winter is the Coleman Lay Z Spa. While you shouldn’t use it under 40 degrees Fahrenheit according to Coleman (This may void your warranty), a lot of people have done so and without trouble. But you have to be careful. The real risk is in case of a brief electricity blackout, the heater has to be started back manually. If the water in the heater freezes, the damage usually cannot be undone. This is how it’s not supposed to be done. Let’s put it this way: Don’t buy this one! We added this one as an example how an inflatable hot tub should NOT look and work like. Average looking and for an average price. You can definitely find much better inflatable spas on our TOP list. Anyway, what does it offer? It has enough room to sit 4 people according to the manufacturer. As with all other “4 person hot tubs”, get ready for some intimate time with your buddies. This is fine if you are close friends, but not so comfortable if you are not. The exterior layer is a brownish synthetic leather. It is a matter of personal preference, but we don’t like it at all. The digital control panel is located on the top of the water pump/heater unit. This unit is pretty small compared to the competition, so controlling the digital control panel from inside the water is a trouble. You have to reach your hands over the side of the spa, and blindly push the buttons. Not good design choice at all. If you want to see a nicely designed control panel, check out this Goplus hot tub. As with all blow-up spas, this one is easy to setup and use too. It will self-inflate using the air blower that later produces massaging bubbles. This is just normal, nothing special. Starter chemicals for shocking and treating the hot tub are not included! Final verdict: We would not choose this one. What are the advantages of blow up jacuzzis? If you already read our inflatable hot tub reviews, take a look at this benefits which a blow-up jacuzzi can bring. I suggest you check out these tips to make the most of your spa! Everybody loves the pleasure of getting into a warm water. Spas have a long story in human history and they never lost their popularity. But built-in permanent spas are pretty costly and often impractical. This is when an inflatable spa comes in place. You can store them in literally no space in comparison to permanent jacuzzis. Did you know that there are as small and practical spas available as this 2 person inflatable hot tub? In my opinion, and the opinion of thousands of other people, there is no better feeling than spending the evening relaxing in a spa. As you may know, when it comes to hot tubs you have a number of different options available on the market. Perhaps the most popular is the idea of a portable inflatable hot tub. Their main advantage is actually in the name. They are portable! You can take them just about wherever you want (within reason of course!). The second advantage is that they are easy to store. One of the main reasons why people choose movable spas is the fact that they really do not have enough space around their home to put a full-sized jacuzzi (those things take up a lot of space!). They do want to enjoy the spoils of some beautifully hot water from time to time though. This is where a blowup one comes into play. You can just inflate it and put it just about anywhere you want. When you are done you can deflate it and put it into storage. Why should I buy an inflatable spa? There is nothing more pleasurable than sinking into a beautifully warm hot tub after a long hard day. Sadly though, not all of us have space, let alone the funds, to actually be able to do this regularly. Thankfully though, there is a solution. Let me introduce you to the idea of an inflatable spa. It does exactly what it says on the tin. When you want to use it, you just pump it up, fill it up with water, and add your chemicals. Once you are done it is simply a case of emptying it out, letting it dry and deflating the spa. You can then leave it in storage until its next use. Most of us will fill it and use it for months! Others will take it out only on special occasions. The obvious advantage of an inflatable jacuzzi is the fact that it will not take up too much space and can be moved away anytime. As you may know, permanent spas are going to take up much more space in the end and they cannot be moved if you change your mind. This is not good for those who have smaller homes. In fact, even larger homes may find that having a permanent hot tub is not the best idea when it comes to utilization of space. They will take up next to none of your space whilst they are in storage. You will actually be surprised at just how small these things are when they are not packed with air. In addition to this, the fact that they are not permanent means that they can be easily transported. How nifty would it be to turn up to a party with a portable hot tub in tow? Absolutely everybody will love you! But don’t forget that the heating will take some time. So it might be a good idea to come a day earlier :). Finally, inflatable hot tubs are a LOT cheaper than their permanent counterparts. When I say a lot cheaper, I mean a fraction of the cost. This means that they are suitable for those who do not have that much of a budget to play with, but love to jump into a spa from time to time. One of the people’s main concerns when it comes to owning an inflatable spa is the fact that they do not think that they are ‘up to the job’. Trust me when I say that blow up hot tubs nowadays are better than they have ever been. The quality of the materials used means that you can place them on just about any flat surface and not have to worry about them ‘breaking’. It is worth noting that in the past inflatable spas tended to be built for just small groups of people. Nowadays though, you can get them in just about any size. This makes them the perfect solution for those who want to use a spa on occasion but simply do not have the space to commit to having a permanent one installed. Don’t worry, these inflatable hot tubs are just as good. We ended up buying intex pure spa, and we are so so happy! Initial heating is quite long, but then we just keep it at temperature … it’s our favorite place to be in the evening! Hi my name is Nicole how do I go about getting an inflatable Jacuzzi please email me back thanks. What exactly would you love to know? Thank you so much for this comprehensive article! Very helpful! I’d be leaning towards the SaluSpa Hawaii with the HydroJet option, the Hard Water Treatment & SaltWater System. However, a big consideration is that I am looking for any type of spa heating / power device that might somehow be GAS POWERED (portable), like for taking camping to an area that has no electricity. Can you suggest any type of GAS POWERED / heated system? I did see a ‘Hydro Hammack’ that had a portable gas-powered hot water heating system, but of course no air jets or water jets. I don’t know of any that would have both gas powered heater, and air jets. I would like to install a portable hot tub on the deck next to my bedroom. I am concerned about the pump making noise while I am not using the tub. Do you have any suggestions/recommendations re: noise levels. Are there any other options for a salt water system besides the Saluspa Hawaii? I don’t mind just having air jets, but have lung issues that make it hard to breathe with the chlorine. I’m interested in a 2-3 person portable that operates on 220. Any info on this inquiry? Hi Peter, I was about to purchase a Coleman inflatable spa, until I found this article and now I am considering the Intex PureSpa. Can you tell me – what put this one in the #1 spot over the Coleman? Thank you for the information. I am interested in putting a spa in my basement. Would you recommend this and which one would be the best? 1. Moisture! It’s great to be able to effectively ventilate the place to prevent the mold from forming. 2. Don’t forget you will have to drain the hot tub, do you have a place to drain it in the basement?